This two-day symposium explores the literature of complaint and grievance, centring on the texts of the Renaissance but welcoming contributions from related areas. Shakespeare (A Lover’s Complaint) and Spenser (Complaints) are central authors of Renaissance complaint, but who else wrote complaint literature, why, and to what effect? Female-voiced complaint was fashionable in the high poetic culture of the 1590s, but what happens to complaint when it is taken up by early modern women writers? What forms—and what purposes—does the literature of complaint and grievance take on in non-elite or manuscript spheres, in miscellanies, commonplace books, petitions, street satires, ballads and songs? What are the classical and biblical traditions on which Renaissance complaint is based? And what happens to complaint after the Renaissance, in Romantic poetry, in the reading and writing cultures of the British colonial world, in contemporary poetry, and in the #metoo movement? For more information, see the full draft programme downloadable here. This entry was posted in conference on 29 January 2019 by ANZAMEMSComms. The call for papers is now open for the 14th annual Limina conference, which will be held at the University of Western Australia on 18-19 July 2019. The theme of this interdisciplinary conference is ‘HUMANIFESTO: Dissecting the Human Experience’. We invite submissions for 20 minute presentations for any topic relating to the intersection of the physical body and the expression of humanity. Please send submissions with the subject line ‘Humanifesto 2019’ to liminajournal@gmail.com, including a title, abstract (200 words), and short biography (50 words) in a single document. Deadline for submission is 31 March, 2019. Join curators from the State Library of New South Wales for a tour of the library, which can trace its history back to 1826. The tour will provide an overview of the different reading rooms in the Library and some of the beautiful spaces and exhibitions in its historic Mitchell Wing. The tour will also include a private viewing of some Renaissance treasures from the Library’s rich and varied collections. Per ANZAMEMS conference tradition, the current Postgraduate Representatives to the Executive Committee (Lisa Rolston and Hannah Skipworth) will hold a reception for ANZAMEMS postgraduates. The ambition behind this year’s event is to provide postgraduates with an opportunity to meet their peers from around Australia and New Zealand and establish connections that will carry them into future endeavours. Honours students and ECRs are most welcome to attend. Free. Please register through this EventBrite link. The librarians of the Rare Books and Special Collections in the Fisher Library at the University of Sydney have generously arranged to show some treasures of the library to conference attendees at a number of scheduled times during the conference. The books include manuscripts and early printed books generally related to the conference theme. The numbers in these sessions will be capped so that visitors can examine the books and talk with the librarians about them. A range of timeslots are available throughout the conference (5-8 February). 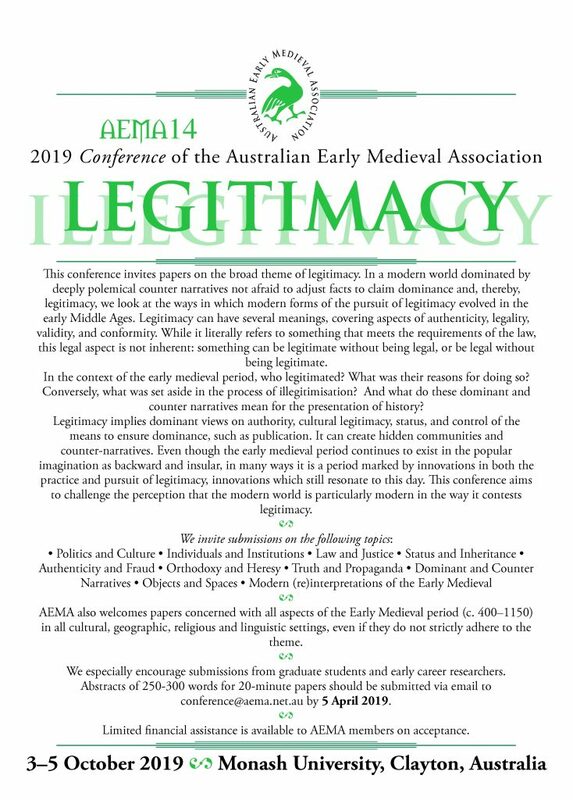 Please see the ANZAMEMS 2019 conference website to check times and register. Other special events include a screening of the film The Devil’s Country, a documentary that explores the intersection of the medieval demonic, the colonial experience of the Australian landscape, and the Indigenous experience of invasion and westward expansion through NSW. There will also be a concert by The Marais Project. This group, founded in 2000 by viola da gambist, Jennifer Eriksson, focuses on the music of the baroque era with a particular emphasis on the works of Marin Marais, a performer and composer at the Court of Louis XIV. This entry was posted in ANZAMEMS, conference, exhibition, performance on 28 January 2019 by ANZAMEMSComms. The British Academy is providing mid-career to senior scholars – active in any discipline within the social sciences and the humanities and based in any country overseas – with the opportunity to work for four years in the UK and make a contribution to UK research and higher education. This new programme aims to demonstrate and further enhance the UK’s commitment to international research partnerships and collaboration as well as strengthen the UK’s research capacity and capability in the humanities and the social sciences. Be a world-class internationally-recognised mid-career to senior researchers who are currently employed outside the United Kingdom, on a permanent contract (which may be part-time or full-time) or, if temporary, would normally be on a contract that will not end during the course of the grant unless expressly agreed with the Academy prior to the application being submitted that such an application would be considered eligible, in any field of the humanities or the social sciences. Hold a doctoral degree (or have equivalent research experience). Be available to take up an unpaid leave of absence, a long-term secondment or employment at an eligible UK host institution. Eligible institutions include but are not limited to the British International Research Institutes. Awards must be taken up between 1 August 2019 – 1 February 2020. Awards are for a period of 4 years. The British Academy will provide funding of up to £187,500 per annum, and up to £750,000 over four years. The host UK institution will be expected to contribute £37,500 per annum (20% of the Academy’s annual contribution) to help support the applicant’s salary in each of the four years. This entry was posted in employment on 22 January 2019 by ANZAMEMSComms. 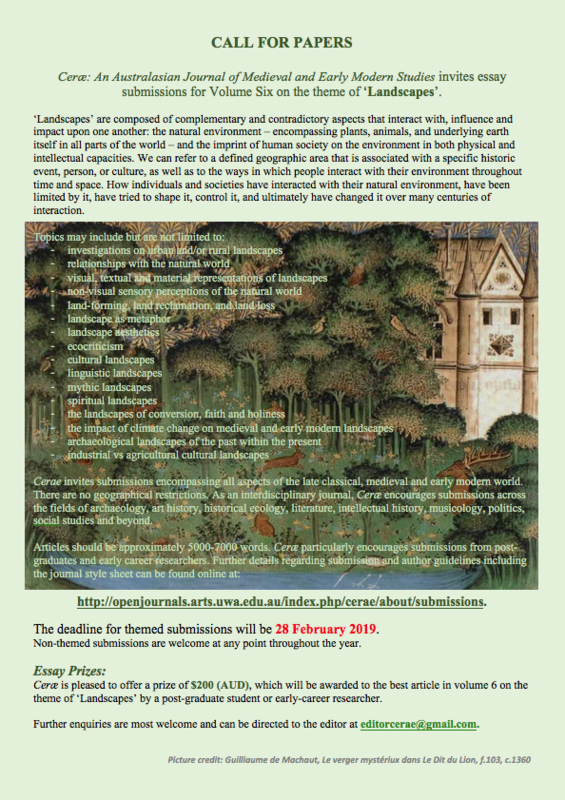 Ceræ: An Australasian Journal of Medieval and Early Modern Studies is calling for submissions for Volume Six on the theme of ‘Landscapes’. ‘Landscapes’ are composed of complementary and contradictory aspects that interact with, influence and impact upon one another: the natural environment – encompassing plants, animals, and underlying earth itself in all parts of the world – and the imprint of human society on the environment in both physical and intellectual capacities. We can refer to a defined geographic area that is associated with a specific historic event, person, or culture, as well as to the ways in which people interact with their environment throughout time and space. How individuals and societies have interacted with their natural environment, have been limited by it, have tried to shape it, control it, and ultimately have changed it over many centuries of interaction. Cerae invites submissions encompassing all aspects of the late classical, medieval and early modern world. There are no geographical restrictions. As an interdisciplinary journal, Ceræ encourages submissions across the fields of archaeology, art history, historical ecology, literature, intellectual history, musicology, politics, social studies and beyond. Articles should be approximately 5000-7000 words. Ceræ particularly encourages submissions from postgraduates and early career researchers. Further details regarding submission and author guidelines including the journal style sheet can be found online at: http://openjournals.arts.uwa.edu.au/index.php/cerae/about/submissions. Non-themed submissions are welcome at any point throughout the year. The deadline for themed submissions will be 28 February 2019. Ceræ is pleased to offer a prize of $200 (AUD), which will be awarded to the best article in volume 6 on the theme of ‘Landscapes’ by a post-graduate student or early-career researcher. All further enquiries are most welcome and can be directed to the editor at editorcerae@gmail.com. This entry was posted in cfp, publication on 22 January 2019 by ANZAMEMSComms.